Imagine the first time you went to see a movie at Anchorage's famed 4th Avenue Theater. Just standing on the sidewalk, looking at the colorful posters showing you what was playing and what would be playing in the weeks and months to come was fun. And as you approached the box office to get your movie tickets, you knew you were about to enter a very special place. With tickets in hand, you enter the theater. You suddenly smell the delicious aroma of fresh popped popcorn and your eye's begin to take in the incredible sight of the theater's beautiful Art Deco style. Some say that the style was also Streamline Moderne and Art Moderne. But whatever style you prefer, one thing is certain. Anchorage's 4th Avenue Theater was a very special place to see a movie. Now, before we look at the rest of the 4th Avenue movie palace, lets walk through those plush curtains to see what's playing. They're about to show previews of a fun John Wayne movie called "North to Alaska." As you take your seat, you look up at the incredible Alaska murals that grace each side of the screen. And remember the North Star and the Big Dipper on the ceiling? "North to Alaska" was a perfect movie to see at the 4th Avenue Theater. Construction of the theater began in 1941, but was stopped because of World War II. Completed in 1947, the 4th Avenue was a very special addition to Anchorage. Now what's your favorite treat when you go to see a movie? Popcorn, soda, Flicks, Bon Bons, JuJubes? 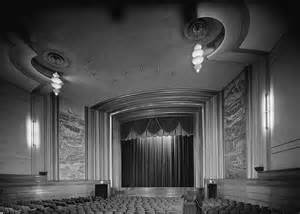 The original 4th Avenue Theater didn't have a concession stand. Cap Lathrop, who built the theater, didn't think a concession stand would be appropriate. Aren't you glad a concession stand was added later? Back in the theater, I recall those extra large seats. I've heard different stories about why there were some oversized seats. One was that they were to accommodate larger theater goers, and another story, the one I like, was that the oversized seats were for a lady and her gentleman to share. Now lets take a break and walk out of the auditorium, through those plush curtains and into the lobby. There it is, that wonderful concession stand filled with delicious treats. And just off to the right of the concession stand was that grand staircase, a staircase so grand that it belonged up there on the screen with Scarlett O'Hara gliding down it's carpeted steps. 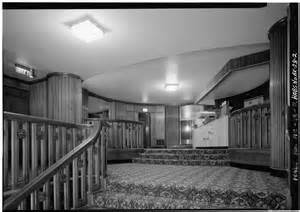 Once on the second floor, the Art Deco design continued to make you feel as though you were a special guest in a palace somewhere in Alaska. The balcony was amazing, and for me, it was the first movie theater balcony I had ever sat in to watch a movie. While Anchorage had several other movie theaters back in the day, including the Denali Theater, and the Impress, none were anywhere near as beautiful or special as the 4th Avenue Theater. Back in 1960, the 4th Avenue Theater ran the Disney movie, "Toby Tyler" starring Kevin Corcoran and a chimpanzee named Mr. Stubbs. The 4th Avenue Theater had been advertising the movie for some time, so when the big Saturday afternoon Anchorage premier arrived, our mom drove us downtown and dropped us off next to the sidewalk outside the 4th Avenue Theater, where a huge crowd had formed. By Anchorage standards in those days, it was a mob scene with kids of all sizes jammed in front of the theater box office to get their tickets. Many years later, on a date with my future wife Mary, we discovered that both of us were in that mob outside the theater waiting to see "Toby Tyler." 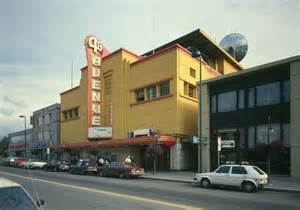 For those of us who lived in Anchorage back in the day, the 4th Avenue Theater has a very special place in our hearts. It was Anchorage's movie palace - it was our movie palace. The last movie Mary and I saw at the 4th Avenue Theater was a re-release of "Gone with the Wind", Mary and I took our daughter Nikki and son Christopher to see the movie and a theater that meant so much to Mary and I growing up in Anchorage. Now, when we see a movie on TV, we ask each other, "did you see this at the 4th Avenue Theater?" Saw Many of the Great Films at the 4th Avenue Theater. You could watch a great film with the Big Dipper and North Star overhead. It cost me 25 cents when I first went there. In the summer of 1962 we moved up from Southern Louisiana to Anchorage, I was 9 years old. We were staying at the Anchorage Westward hotel on 3rd St. We walked over to the 4th Avenue theater to see a Disney movie. I was amazed at how beautiful the walls where near the screen, and wondered how they where made. As the years went by and overtime I would go to see a movie there. I loved the art work and how it showed how Alaska was making its way through the scenes of this art work. Even to this day I still love looking at it, brings back very fond memories of my youth.